IP letters stand for “International Protection” rating or “Ingress Protection” rating. IP ratings are defined in international standard (British BS EN 60529, IEC 60509). It is used to explain levels of sealing effectiveness of electrical enclosures against foreign bodies (tools, dirt etc) and moisture. The numbers of IP of each have a specific meaning. First Number: The first Number indicates the degree of protection from moving parts, as well as the protection of enclosed equipment from foreign bodies. Second Number: The second Number indicates the protection level that the enclosure enjoys from various forms of moisture (drips, sprays, submersion etc). Third Number: The third digit in the designator is not part of the official IEC standard and is sometimes included (but more often omitted) to reference additional protections. No special protection No protection. No protection. IP65 Enclosure: IP rated as protection against dust (6) and protection from low water pressure (5). Luminaries are properly selected and mounted on a location most feasible and effective with minimum cost. For a 230 volts system, a voltage drop of 5% is allowed although in extreme cases 15% voltage drop is sometimes tolerated. cu = Coefficient of utilization. Which is dependent on the type of fixture, mounting height, width of roadway and the length of mast arm of outreach? The value of Al varies depending upon the type of lamp specified. 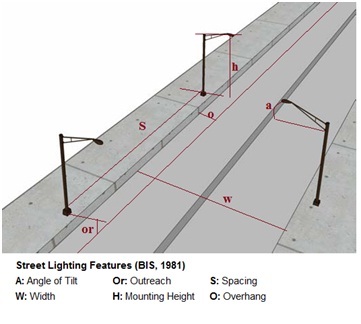 Calculate Lamp Lumen for street Light Pole having Road width of 7 meter, distance between two Pole is 50 meter, Maintenance factor is 0.9, Coefficient of utilization factor is 0.29, light pedestrian traffic is medium and Vehicular traffic is very light and Road is concrete road. From Above table Recommended of illumination (E) in Lux is 6.46 per sq. meter. To decide Lamp Watt It is necessary to calculate Average Lumens of Lamp (Al). Lamp lumen of a 250 watts lamp is 11,500 lm which is the nearest value to 8662.83 lumen. Therefore, a 250 watts lamp is acceptable. E= (11500×0.29×0.9) / (7×50) = 8.57 lumen per sq meter. Actual illumination (E) for 250 Watt is 8.57 lumen per sq meter which is higher than recommended illumination (E) 6.46. Hence 250 watt gives adequately lighting. The allowed illumination time in hours T = k.t.1000/E. In sunlight (100000 lux) and extension factor 1: The permissible illumination time (T) =1 x 70 x 1000/100 000 = 0.7 hour. In halogen light (200 lux) and extension factor 2.3: The permissible illumination time (T) = 2.3 x 70 x 1000/200 = 805 hours. In UV-filtered halogen light (200 lux) and extension factor 3.5: The permissible illumination time (T) = 3.5 x 70 x 1000/200 = 1225 hours. Running cost = cost of electricity in $/kWh x wattage of lamp x lifetime in hours. 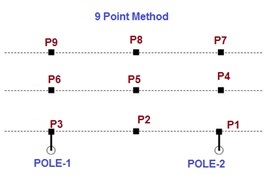 The Average Lux Level of Street Light is measured by 9 point method. Make two equal quadrants between two Street light poles. on the lane of light poles( one side pole to road). We have 3 points P1,P2 and P3 under the light pole then P4 & P7 are points opposite pole 1 or Point P3 same is applicable for P6 and P9 for Pole 2.